The world-wide web has become a constantly flowing stream of information. Maintaining your site is one of the most important aspects of an effective presence and a competitive edge on the web. In order for you site to draw attention from visitors and from search engines, it must be maintained with fresh content and keep up with the latest technology. 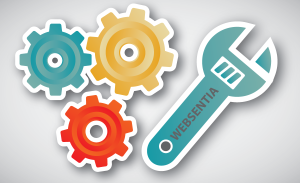 We keep your website shiny and new with our website maintenance services. Accessibility Updates – the requirements for keeping your website accessible for all users changes as does our awareness of the users’ needs. Security Updates – for many sites, especially content management systems, cyber security is a constant battle. While we are small potatoes to many in the world of cyber crime, we must remain vigilant and maintain updates through secure and trusted sources. Web Traffic Monitoring – we recommend using analytics software and watching trends and how they relate to your brick-and-mortar world. Google Analytics is free and is foremost in a long line of analytics available for your needs. Communication with you – Most of all, we cannot sit in a closet and imagine what is happening in your world. We must be in contact to keep our thinking in alignment. Maintenance is critical to all aspects of your website. These services are managed and priced realistically…. a real necessity for keeping your web presence alive and growing!